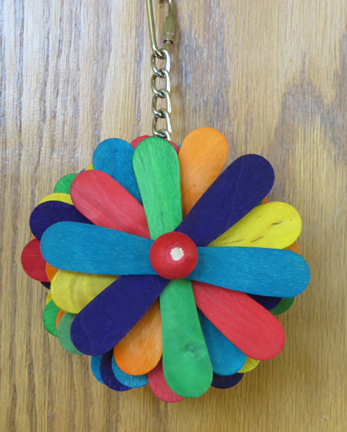 Two sizes in the very popular Rosette toy. 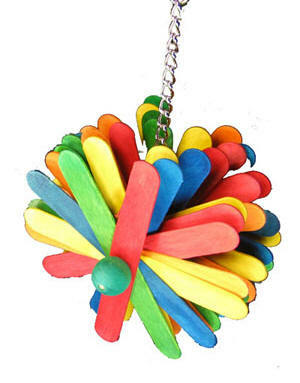 This toy has layers and layers of colorful, chewable wooden sticks held together on a wooden dowel with fun, wooden balls on each side. They are hung from nickel plated welded chain and topped with a quick link for easy hanging. Does your bird love sticks ... then this is a must have!! The small is suitable for smaller to mid sized beaks ... the large is fine for most mid sized beaks in your life!